Perhaps Alfa Romeo will give the car a minor refresh. 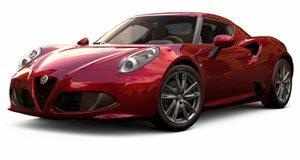 The Alfa Romeo 4C is an extremely lightweight, track-focused sports car. However, the US market hasn't had the Alfa Romeo brand for quite some time, so there was bound to be some brand confusion when the car company came into the market with only one niche model. We liked the 4C when it first came out, but didn't think that it was special enough to steal sales from established cars in the same price range like the Porsche Cayman and Chevy Corvette. Perhaps that may have been due to how the 4C was styled. The 4C has classic Italian car beauty, but US consumers like their sports cars to be a bit more aggressive. Alfa Romeo has already admitted that is was wrong once with the 4C's styling when it switched from those weird, insect-like headlights to more conventional ones. In either case, the 4C doesn't look all that aggressive to our eyes. Alfa Romeo is looking to replace the 4C with a more affordable coupe model, but this hasn't stopped designer, Marco Maltese, from rendering a more aggressive looking 4C. Maltese has given the car more aggressive headlights, horizontal taillights instead of round ones, and larger air vents. These small changes add up to create something amazing. We think that if the 4C had looked like this from the start, it may have sold more in the US. The 4C had many other issues that limited its sales success, such as an extreme lack of creature comforts. The 4C is a great fourth car, perhaps that is what the letters stand for, "fourth car." We make this joke because even cars like the Cayman and Corvette offer a bit of practically that make them reasonable second cars. We don't think that the 4C's successor will be very similar to the current model, but we can still gawk over this stunning rendering.